The AFS2 Advanced Feedback Suppression processor has been completely re-designed to take the foundation of the best selling AFS224 and bring it to thte next level. The AFS2 now offers the highly-intuitive Wizard function that takes all of the guesswork out of setting up any room. The AFS2 also incorporates a completely re-designed Advanced Feeback Supression module. Best of all, the AFS2 now provides the user with a full LCD display setup and monitoring. With its powerful DSP module, the AFS2 provides all the processing and control necessary for both installation and live use. Ten and twelve filter feedback elimination processors are the de facto standard, but the AFS2 offers a dedicated feedback suppression processor that offers up to 24 filters per channel with filter Qs up to 1/80 of an octave. To achieve these staggering numbers dbx utilized their improved AFS technology that had previously only been available in the upper echelon line of products and made it available in this stand-alone processor. In addition to the plethora of feedback suppression filters available, the AFS2 also offers selectable modes, live filter lift, and types of filtration, which are all readily available via the intuitive user interface front panel. With all of these state-of-the-art features in place, not only do you hear no evil, but you will now be able to see no evil. 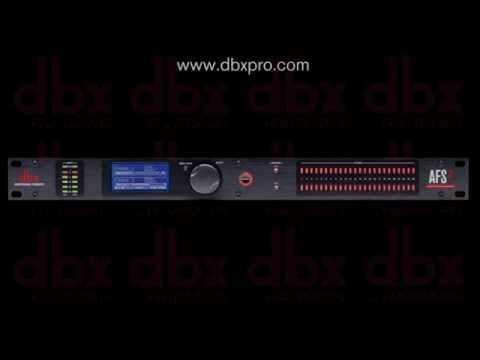 This video will show you how easy it is to set up of the new dbx AFS2 Advanced Feedback Suppression Processor with a basic P.A. system. The AFS2 will allow you to control any feedback you make encounter while running your live system. Sound Technology’s professional audio products are specified and supplied by leading resellers and integrators throughout the country, together with a select number of trade distributors. If you are a trade customer please call Sound Technology Ltd on +44(0)1462 480000 for more information or call one of our sub-distributors listed below.